While decorating the Christmas tree last night, I took this ornament out of the box and all at once I was lost in the memory of where I was one year ago. 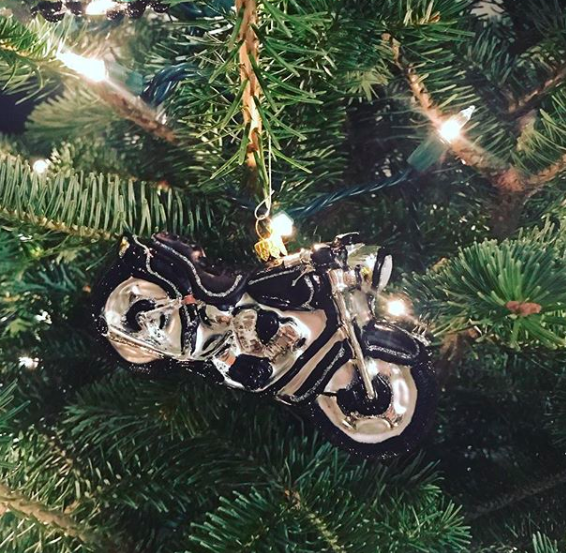 Last year, I stumbled upon this motorcycle ornament at HomeGoods. It felt like a sign. The thing is, that year had begun with a project of mine being rejected by my publisher. The novel featured the arrival of a mysterious man on a motorcycle. It was a story that meant a lot to me, but maybe, maybe, I was starting to think, that I wasn’t quite ready to tell. It was a boy POV, after all, and maybe I didn’t yet have the skill required to tell it. So I’d shelved it, focusing instead on the project that felt, at least at the time, easier. But the thing was, I couldn’t let go of that story. Or Drew. Or Phil, the man on the motorcycle who Drew becomes convinced could be his father, even though every fact points to the harsh reality that his father died three years ago, by suicide. Maybe I didn’t get Drew’s story exactly right. Maybe it just needed more work. More time. And so I revised it again. Had to convince my agent that this project, not the ostensibly easier to sell/write one, should be my focus. I bought this motorcycle ornament last year, hoping, hoping, hoping that I’d finally gotten the story right. That an editor might fall in love with it the way I had. That wish came true. Drew’s story will soon go to copyedits, and will be published in spring 2020 by Aladdin/Simon & Schuster, though we’re still working out the title. Sometimes, that’s all we need. Next > 2018, what. a. year.